We’re engrossed with reality TV these days, yet we so often neglect the greatest reality of all: the reality of our nation and how it came to be. In Error Australis, TV columnist, comedian and history buff Ben Pobjie recaps the history of Australia from its humble beginnings as a small patch of rapidly cooling rock to its modern-day status as one of the major powers of the sub-Asian super-Antarctic next-to-Africa region. As thrilling as it is to see Delta Goodrem’s chair turn around, there’s an argument that World War Two was even more exciting and, like any good recapper, Pobjie provides an immediate, visceral sense of what it was like to be there in the moment at our nation’s defining events. It is only by looking at where we have been that we can understand who we are, what we stand for and why nothing seems to work. 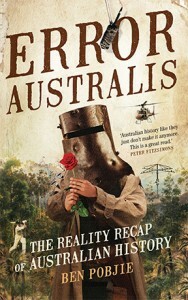 Error Australis is a scholarly and hilarious account of a young nation that has spent many years seeking its place in the world, and almost as many years not liking what it has found.